Another card using the Bouquet Blooms! It just screams for bright colors, don't you think? Check out that ribbon!! I colored it myself! It comes in very vanilla or whisper white, but just use a sponge dauber and an ink pad -- it can be any color you want! Just a hint -- let it dry before you try to use it on a project! See the tiny smudge on the left side?? I need some patience! haha!! This set appealed to me right away with it's fun, bold flowers! It's a nice simple, one-layer card! I think I'll send these to anyone that places an order this month! Stamp the most solid image of the rose in Blushing Bride. Follow with the 2nd most solid image in Lovely Lipstick. I found that you can line up the images “perfectly”, but it’s really not necessary for a pretty rose. Stamp the solid, single leaf image in Granny Apple Green, then follow with the accent leaf image in Call Me Clover. Stamp sentiment in upper left corner, using Tuxedo Black Memento ink. Adhere two of the Faceted Dots (black) as the “dots” on the two “I’s” in the sentiment. Using SNAIL adhesive, attach the whisper white panel to the Basic Black cardstock. Tie Polka Dot Tulle Ribbon around this panel – tie with a simple knot. Then adhere to your Lovely Lipstick cardbase. We're starting a new round of clubs in September!! Would you like to be a member? Check out the details HERE! You've seen the new catalog. You've drooled over the newly released colors, stamps, and accessories. Your wish list is growing faster than summer weeds. If that sounds familiar, then you know it's time to become part of my Stampin' Up! family. Only when you join now through the end of July, your Starter Kit will grow to include 10 new ink pads! 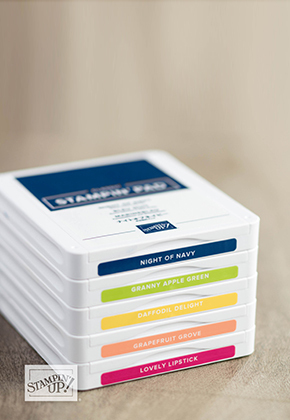 A whole color family of your choice in the new and improved ink pad cases. That's an additional value of $67.50 on top of the already amazing Starter Kit deal. When you join now, you'll get more of your wish list for less, plus have the opportunity for an ongoing discount, the ability to earn some extra money, and be a part of my team of amazing stampers. Being a part of the Stampin' Up! family is something I'm so glad I chose to do, and I can't wait for you to be part of this family, too! Stampin' Up! 's Demonstrator Starter Kit is completely customizable! Receive 20% percent discount on all Stampin' Up! products, including stamp sets, paper, and accessories. Support from Stampin' Up! through audio and video trainings, a magazine, and a demonstrator-only website with thousands of ideas! Which color family will you choose? Stampin' Up! 's Demonstrator Starter Kit is completely customizable! Build your Starter Kit your way! For just $99, you get your choice of up to $125 worth of any current Stampin' Up! products. We'll include a business supply pack and shipping at no extra cost to you. Get FREE Artisan Pearls with a qualifying order! Click HERE for all the details! I love a good sale!! And Stampin' Up! is offering their Buy 3 Get 1 FREE! sale on Designer Paper!! Only good for July!